As a travel enthusiast often times it’s a photo or a collection of photos that inspires me to pick my next travel destination. Perhaps that’s why platforms like Pinterest and Instagram have become so popular. They say a picture is worth a thousand words and this is especially true about the North Coast of Northern Ireland. 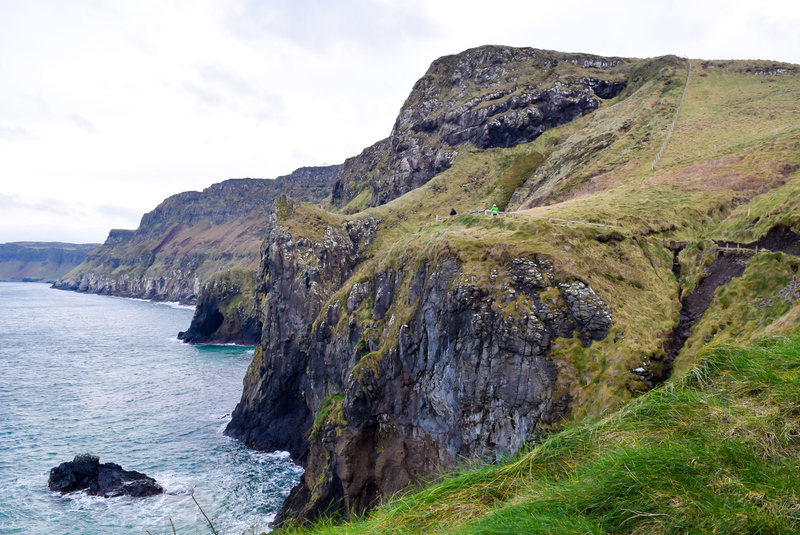 Highly recommended by other travelers and many travel guides and publications, Giant’s Causeway and Carrick-a-Rede Rope Bridge are some of the most popular attractions to visit in Northern Ireland. 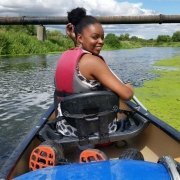 Since I love beautiful landscapes and already spent a few days in Dublin, I figured that this would be a great opportunity to spend some time exploring the six counties of Northern Ireland. 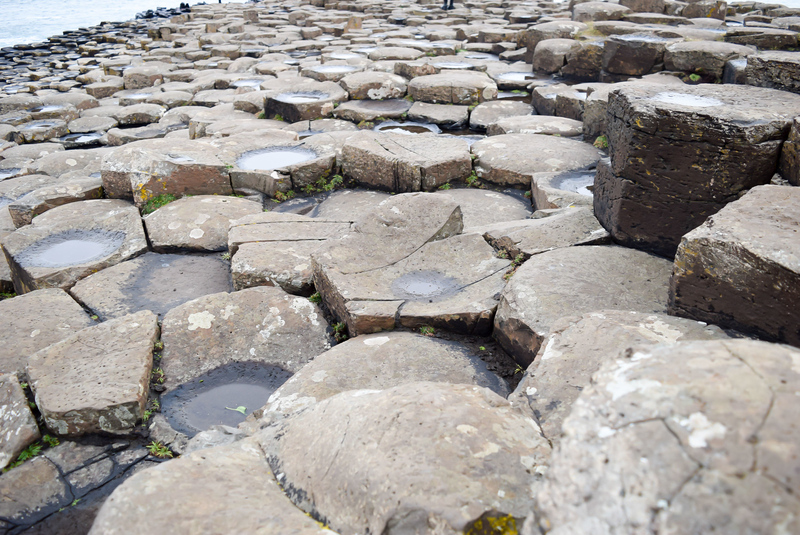 Not wanting to deal with the hassles of renting a car or driving on the left side of the road, I booked a Giant’s Causeway, Belfast City and Carrick-a-Rede day trip with Wild Rover, a local tour operator in Dublin. 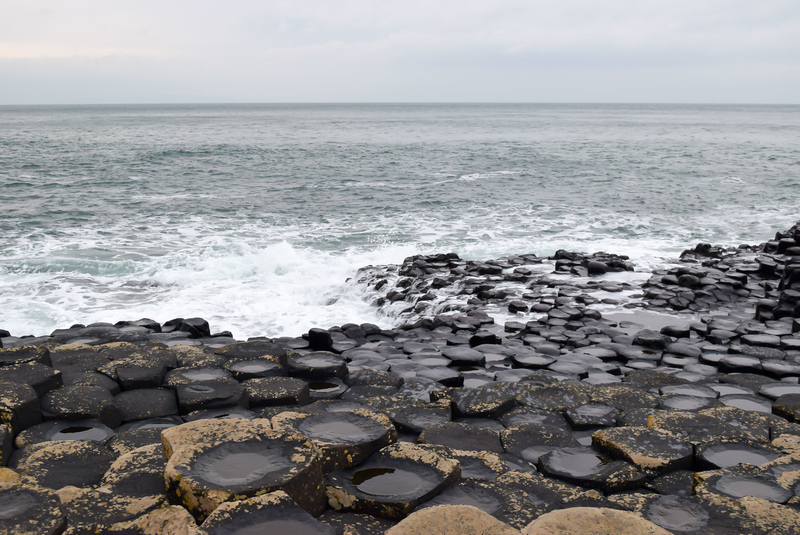 One of the most important things to remember while planning a trip to Northern Ireland is that Northern Ireland is part of the United Kingdom which means that you’ll use the British Pound Sterling (£) as currency. If you’re coming from Ireland you’ll have to swap out your Euros for Pound Sterling. Hit up an ATM or use a preferably no foreign transaction fee credit card to bypass the currency exchange fees. The Carrick-a-Rede Rope Bridge is a historic rope bridge completed in 1755 which connects the mainland (County Antrim) to Carrick-a-Rede Island. For almost 400 years, fishermen used the bridge to fish for migrating Atlantic salmon off the island. Nicknamed “Rock in the Road”, this small island was once home to a thriving fishing industry. At one point in the 1960s fishermen caught 300 fish a day from June to September. However by 2002 the salmon fishery at Carrick-a-Rede closed down because there weren’t many salmon left in the area. 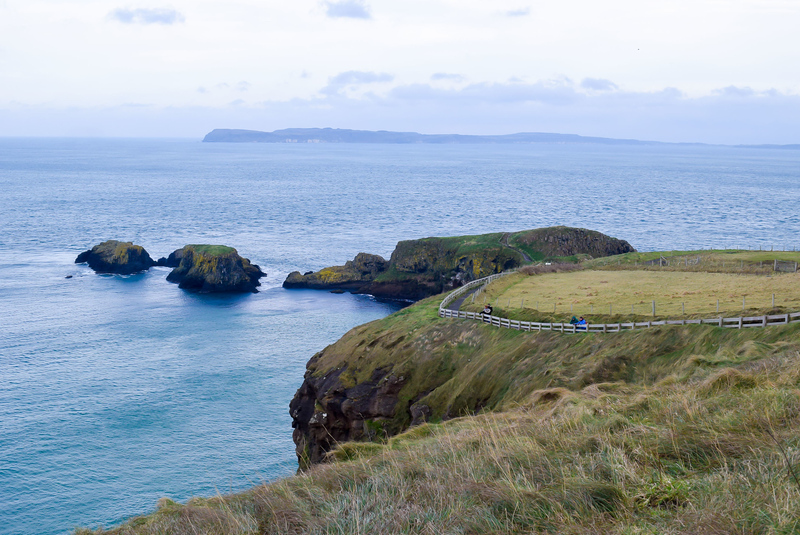 Carrick-a-Rede Island and Carrick-a-Rede Rope Bridge are now historic sites run by the National Trust. 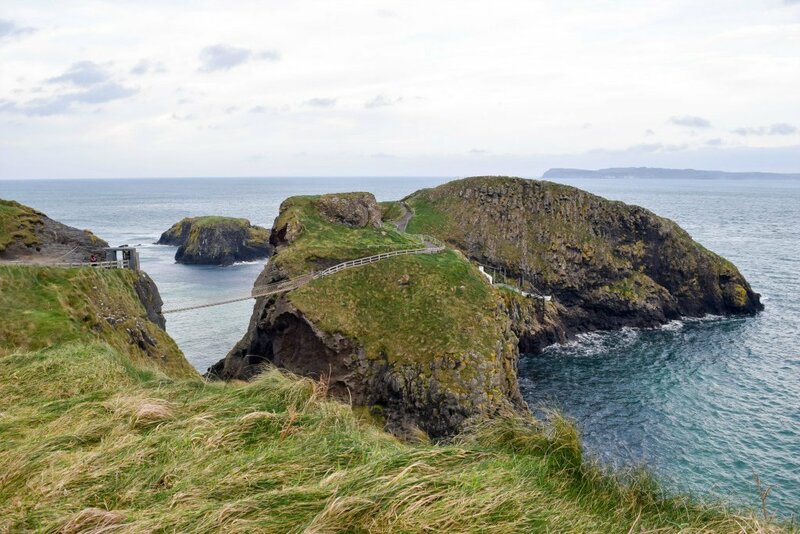 Suspended 100 ft above sea level and only 65 ft long, crossing the Carrick-a-Rede Rope Bridge is a North Coast highlight for thrillseekers brave enough to cross the wooden slats and take in the coastal views. Our coastal hike started at the parking lot where there’s a small reception hut granting admission to the park. Although exploring the park and walking down to the bridge’s entrance is free, if you want to cross the rope bridge you’ll have to pay an admission of £8 for adults and £4 for children. Over the high cliffs I could see the turquoise waters, the massive waves crashing into the jagged rocks down below and to my right there were green coastal farmlands with patchy fields. 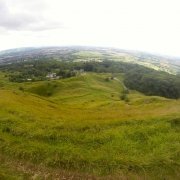 If you need to rest or want to spend some time admiring the views there are plenty of benches along the route. There are also lots of seabirds flying overhead which makes this a great place for bird watching. In the water you may even see basking sharks and playful dolphins! I followed the path until I was greeted by a National Trust Ranger who unfortunately notified us that since the winds were too strong, we couldn’t cross the bridge. The rope sways ever-so slightly so it makes sense to take the necessary precautions. However many say that the views of the mainland from the island and the caves inside the cliffs are breathtaking. On a clear day you can even see as far as Scotland and Rathlin Island which are approximately 12 miles away. Overall the hike to Carrick-a-Rede Rope Bridge was easy but there were some steep steps and slippery surfaces so I recommend wearing closed toed shoes and watching your step. The walking route is about 1 mile and takes an hour to complete. 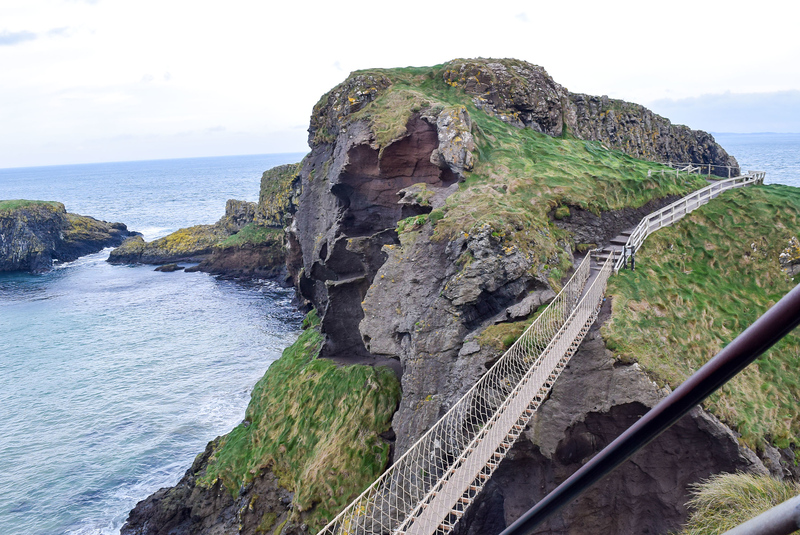 If you’re joining a bus tour, crossing the Carrick-a-Rede Rope Bridge is included in the price of the day tour. Bring a scarf or wear extra layers because it gets windy on the walking trail. Since there’s only one road leading to the Carrick-a-Rede Rope Bridge, you don’t have to worry about getting lost. Lastly, there’s a booking system where you can reserve your tickets to cross the bridge ahead of time. However the National Trust recommends coming early to avoid the large crowds. From vibrant photos to tips and travel inspiration, use the Trover app to find other unique places to visit in Northern Ireland and around the world. 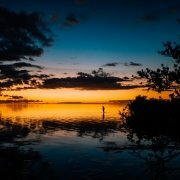 Trover is a unique photo app and social platform designed to help travelers plan for a trip. Within the app you can visually keep track of all of the places you want to visit, discover new places and connect with other travelers and photographers. Showcase your photos around the web by using the Trover widget. And if you connect through Facebook, Trover will automatically connect you to your friends. I’ve added some other photos I found of outdoor spaces in Northern Ireland in a list on Trover. I’ve embedded the list of my favorites below. 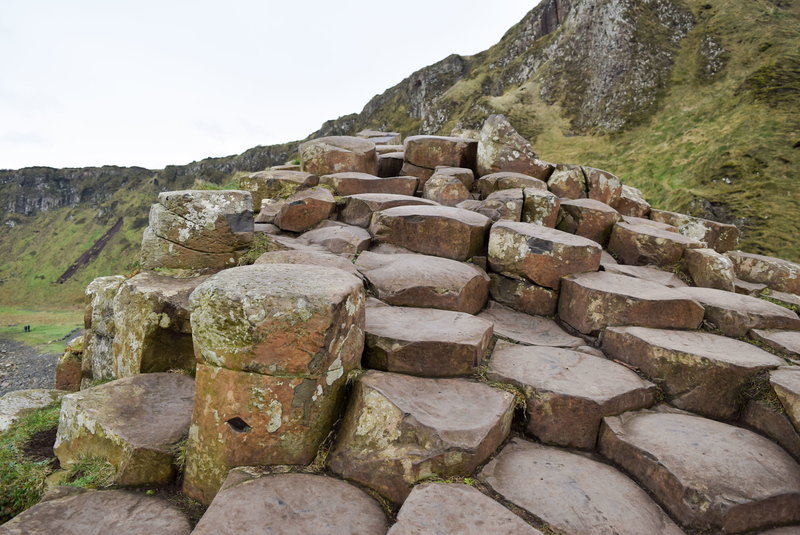 The Giant’s Causeway is Northern Ireland’s first UNESCO World Heritage Site. Named one of the natural wonders of the United Kingdom, the Giant’s Causeway is a rare natural phenomena sticking out of the ocean. 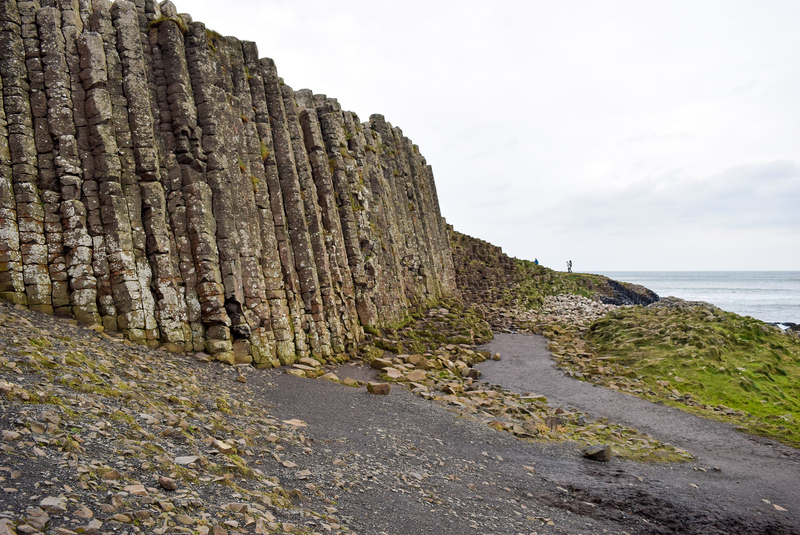 Formed after a series of volcanic eruptions, the national nature reserve consists of 40,000 hexagonal-shaped basalt columns. Some stone columns have four to eight sides and most have smooth surfaces. 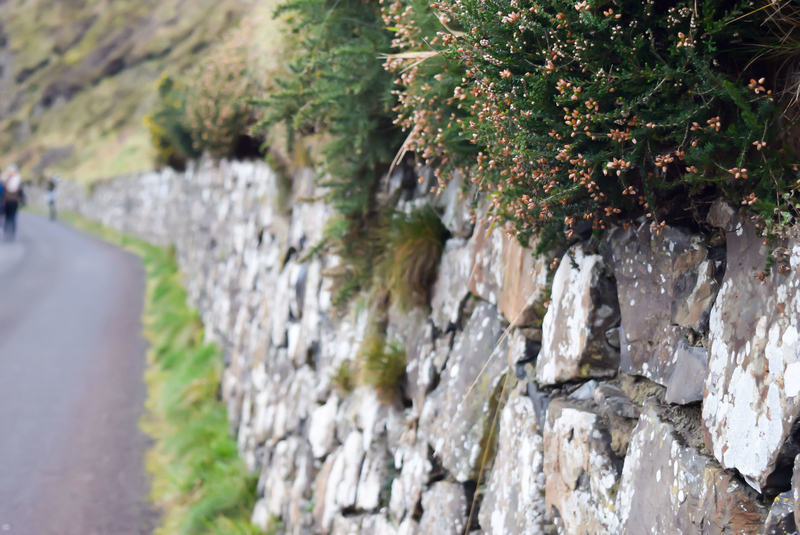 Legend has it though that the causeway was formed by the Irish giant Fionn mac Cumhaill (Finn McCool) who picked a fight with a Scottish giant Benandonner across the way. According to the legend, Fionn built the causeway as a way to get to Scotland but Benandonner later ripped it apart leaving behind what we see today. 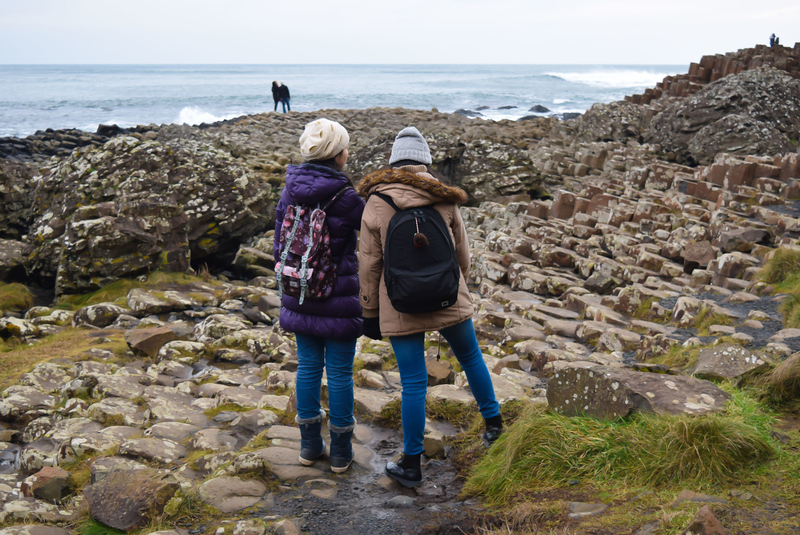 You can easily get to the Giant’s Causeway by either walking directly onto the rocks or hopping on the Ulsterbus, a shuttle bus for those who need assistance getting to the site. The road to the rock formations is approximately 0.5 miles (0.8km) and it is easy to navigate. Once you get to the Causeway you can walk the “pavement” or climb the natural staircases inching towards the Atlantic Ocean. The Giant’s Causeway is dramatic and made me appreciate nature in all her magnificent glory! The basalt formations are simply unreal and it’s truly amazing how nature can make a masterpiece so perfect. 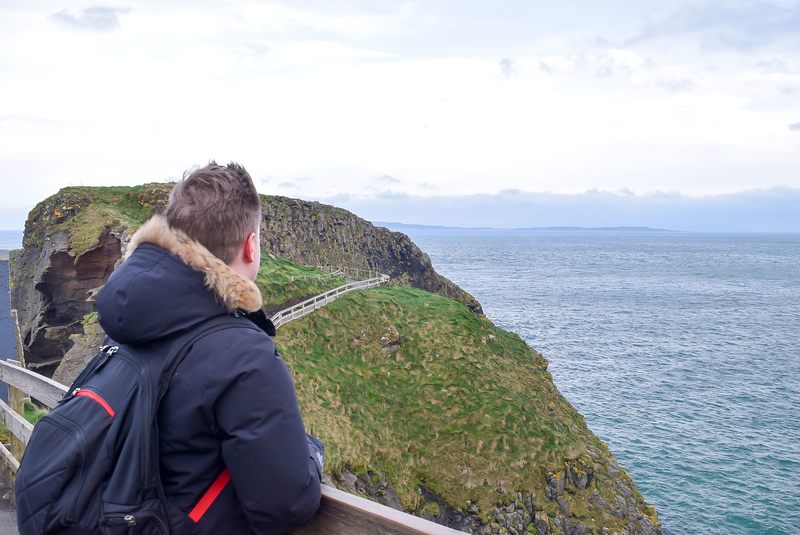 Again if you plan to explore Northern Ireland’s six counties, I highly recommend including the Giant’s Causeway and Carrick-a-Rede Rope Bridge to your travel plans. Looking for more travel inspiration on the North Coast of Northern Ireland? 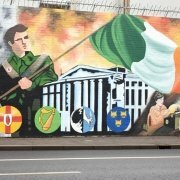 Have you visited Northern Ireland? What’s your favorite outdoor attraction?